"Community Conversations" Held Across the State June 25-28! The Community Conversations events are hosted by ASK Resource Center and will be held June 25-28 from 6:30-7:30 pm in the following communities across Iowa: Creston, Cedar Rapids, Davenport, and West Des Moines. This event is hosted by ASK Resource Center and is open only to parents, family members, and caregivers. $20 participation stipends are available for those who attend; RSVP required. Questions? 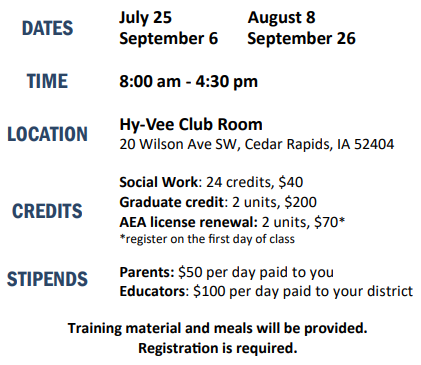 Contact Karen Thompson at ASK Resource Center, karen@askresource.org or (515) 243-1713 ext. 207. Through My Eyes is a disability simulation documentary filmed in Iowa City. The documentary takes you through a day of four abled-bodied individuals that have volunteered to experience what it is like to be a person with a disability. 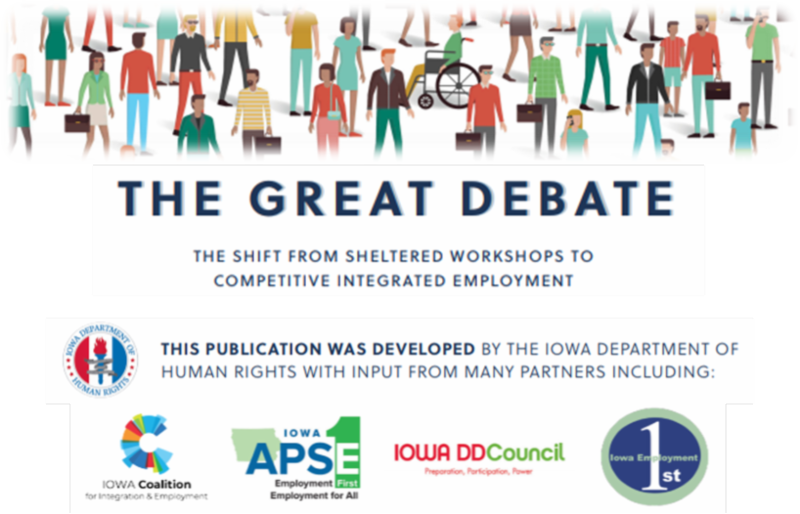 The Great Debate: The Shift from Sheltered Workshops for Competitive Integrated Employment is a publication intended to provide a history of sub-minimum wage employment and an assessment of the arguments in favor of sheltered work for people with disabilities. It is an attempt to help individuals with disabilities understand the benefits of competitive integrated employment and the resources available to assist them in reaching their employment goals. The guidebook was created by the Iowa Department of Human Rights in collaboration with the Iowa Chapter of the Association of People Supporting Employment First and the Iowa Coalition for Integration and Employment.